A Skolnik HM5504 Open Head 55 Gallon Salvage Drum is constructed of high quality carbon steel and meets the UN design type requirements. 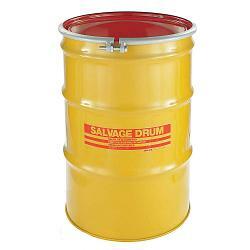 Standard Salvage Drums feature yellow bodies with yellow or red covers, with a multilingual salvage drum logo in red. Available options include 3/4" vent plugs and corrosion resistant epoxy phenolic lining. Each Skolnik Steel Salvage Drum tests successfully on relevant international standards, including the "T" rated salvage drum. Skolnik warrants for a period of thirty days (30) from the date of shipment that its products are manufactured and shipped free from substantial defects in materials and workman ship and are in conformance with Certificates of Conformance or Compliance or the like, if any, signed by its authorized representative, provided, however, that the foregoing is subject as to each shipment to variations permitted by the quality level or sampling procedure specified by Buyer or to the quality level or sampling procedure of Skolnik if they are not specified by Buyer. 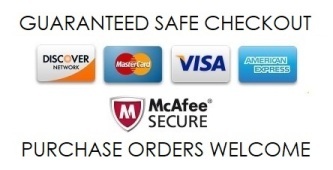 Buyer is to inspect the products and should failure to conform to this warranty be discovered within the warranty period, Skolnik will, if promptly notified, remedy the failure by suitable repair or replacement of the products at its own expense or, at its option, by refund of the portion of the purchase price attributable to products comprising the failure. Products manufactured by others and furnished by Skolnik are limited to the original manufacturer's warranty, if any, and sold AS IS and all liability of Skolnik due to inadequacies of such products is excluded and disclaimed. All liability of Skolnik due to inadequacies of products which have been damaged, altered, reworked, repaired, modified, or processed after shipment is excluded and disclaimed.